Disabled women are often isolated and hidden away, so we know very little about their struggles. To mark the end of the United Nations' Decade of Disabled People in 1992, disabled women from around the globe have written open letters to the world describing their individual plights. In parts of the world where being a woman automatically demotes one to being a second class citizen, being a disabled woman represents a double dose of discrimination. 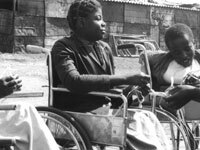 In this moving program, we hear the sadness and the hope of disabled women in Zimbabwe. We share in their struggle to survive on a daily basis and to create a better world for their children. Not only will LETTERS FROM OUR LIVES foster a deeper understanding of people with disabilities, but it will send an inspirational message to anyone facing a hardship. It will touch a deep chord within all viewers.